Don't have the time or inclination for all that kneading, proving and waiting around for dough to rise? A soda bread recipe is a short cut to fresh bread and the results can be delicious. 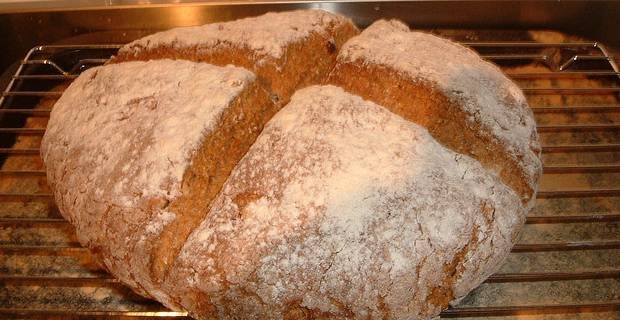 Soda bread is a favourite loaf in Ireland and it's the ideal solution when you are in a hurry. A basic soda bread recipe uses equal parts self-raising and plain flour with half a spoon of bicarbonate of soda and a little salt. You can use just plain flour but will need to increase the bicarbonate of soda. The liquid traditionally used in Ireland to make soda bread dough is buttermilk. Live wholemilk yogurt mixed with milk will do if buttermilk is unavailable. Some bakers use a dash of light hoppy beer for added flavour. The dough needs very little kneading before it's ready to form into a loaf. About a minute should suffice as you are not attempting to break down the glutens to get the same texture as normal bread. Traditionally, soda bread is cut with a deep cross before baking. The Irish say this is to ward off evil, but it has the practical results of preventing cracking and allowing the finished loaf to be quartered easily. Bake for around 30 minutes in a hot oven (around 400F) until the loaf is crisp on top and sounds hollow when the base is tapped. The basic soda bread recipe lends itself to tweaking. Use wholemeal flour or a blend of wholemeal and white flour for a flavour variation. Adding seeds like sesame, poppy or even fennel will add character to your soda bread. You will need to adjust the basic soda bread recipe to suit your family's tastes. Some find that a loaf made with all buttermilk can be too salty, others are unimpressed by the slight sourdough tang imparted by yoghurt. Getting exactly the right amount of bicarbonate of soda to ensure a light loaf can be an artform.